The Goat Farm Arts Center is a major visual and performing arts center located in what was once an underutilized historic site that went through a major expansion in 2009. The Goat Farm includes 12 acres of grounds and 12 turn-of-the-century brick structures. The facility has five performance and exhibition spaces: Goodson Yard, Minor Hall 1 (The Rodriguez Room) and Minor Hall 2 (Robert's Hoard), along with the two exterior venues Village Green and Dovetail. 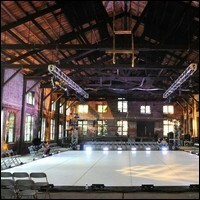 The Goat Farm hosts classical and contemporary music concerts, traditional and experimental theatrical performances, film screenings, contemporary dance performances, and art exhibitions.